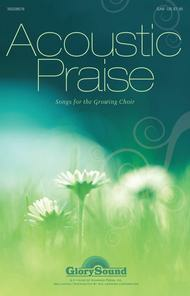 Acoustic Praise ((Songs for the Growing Choir)). Composed by Diane Hannibal, Don Besig, Jon Paige, Joseph M. Martin, Matt Limbaugh, Nancy Price, Pepper Choplin, Wes Hannibal, and James M. Stevens. For Choral (SAB). Glory Sound Simply Sacred. Softcover. 96 pages. Published by Glory Sound (HL.35028676).ISBN 1476874565. 6.75x10.5 inches.This helpful choral songbook contains newly composed songs and classics arranged with sensitivity to smaller and developing choirs. Thoughtful SAB voicing makes this useful resource a must-do for slim Sundays and for times when rehearsal times are limited. The acoustic qualities of the arrangements and the optional instrumental obbligatos open this book up to both traditional and contemporary-styled worship ensembles. A variety of subjects and writers are featured and a pleasant track option is available. Titles include:Come, Walk With Me; The Earth Is the Lord's; Hear Us, O Father; I Will Rejoice and Be Glad; Lord of Life; On Jordan's Stormy Banks; One Day We'll Stand; Train Up a Child; A Choral Benediction. Available separately: SAB Book, Listening CD, Preview Pack, Instrumental Pack CD-ROM, StudioTrax CD.